Services - Help Us To Help You! The service industry is a unique field in which to do business. It requires a great deal of planning, patience, and dedication, but it's more enjoyable than you know. Our job is to provide you with the best limousine service in South Jersey, and knowing that our customers are happy is our greatest reward. 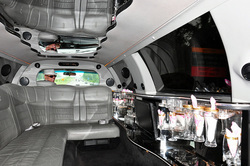 Our vehicles are exquisitely detailed and maintained. Our drivers are knowledgeable, classy, and professional. We are punctual. Being late is not an option. We do not get lost. Our trips are mapped out ahead of time. We have Flatscreen TV's and State of the Art Sound Systems for your entertainment. Of course there is a Wet bar. We do our best to accommodate any special requests. Life is filled with so many events. Some are as every day and mundane as getting to the airport while others are as rare and special as the commitment of marriage. We do our best to make them all as exciting and memorable as possible.